In this new system, the higher risk score, the more likely it will be that a judge will impose a higher bail amount, which could impact a defendants ability to be released – potentially detaining a defendant during the entire pendency of the criminal case until a final disposition. In addition, the higher the risk score, the more judges will impose other liberty and privacy-restricting conditions, such as house arrest, GPS ankle monitors, screening for substance abuse, supervision, and the equivalent of pre-conviction probation programs. So, what’s the story on these pretrial risk assessment algorithm tools? There is a growing debate as to whether algorithms in criminal justice actually increase an already biased criminal justice system, which many commentators believe is harsher on African-American and Hispanic defendants. In fact, one commentator, Professor Richard Berk at the University of Pennsylvania has said that creating a risk assessment algorithm that does not have “baked-in” bias is impossible, because the data that goes into the algorithm is descriptive of a system that has a disparate impact upon people who are specifically protected from discrimination based on age, gender, national origin, or race. We are merely locking ourselves into the past by building a system based on past data and pigeonholing people into categories based on that. Related: Machine Bias – There’s software used across the country to predict future criminals. And it’s biased against blacks. As a result of these problems, many national civil rights groups and civil rights groups at the state and local level are encouraging jurisdictions to put the brakes in this justice-by-algorithm model, at least long enough to tighten-up the regulation and testing of these algorithms to understand their inherent biases against protected classes. Compounding these serious concerns about these “black box” risk tools is a nearly total lack of transparency in this area: the data used to build the tools are not open and transparent, nor is the statistical analysis that is conducted open to researchers or the public. In fact, Professor Rebecca Wexler of Yale University makes a strong argument that proprietary algorithms should be eliminated from the criminal justice system because the owners of the algorithms are able to assert trade secret protections to prevent defendants from being able to challenge the results and recommendations of an algorithm. How are we protected when we cannot even challenge the “AI” Judge making a release recommendation? Of no surprise, the “El Paso Smart Praxis,” El Paso’s pretrial risk assessment tool, also relies also on demographic factors and un-convicted conduct (i.e., arrests by police that do not result in convictions). Former United States Attorney General Eric Holder strongly criticized any reliance on demographic factors, as have various persons on both sides of the aisle, because demographic factors may correlate with poverty and race, and thus, as Professor Berk said, have the effect of baking-in bias. For example, one factor is whether person owns or rents their residence. See the problem yet? Regarding un-convicted conduct, because minority defendants are arrested at a higher per capita rate, putting un-convicted conduct into an algorithm will have a harsher effect on those defendants. But, in El Paso it’s worse. Much worse. 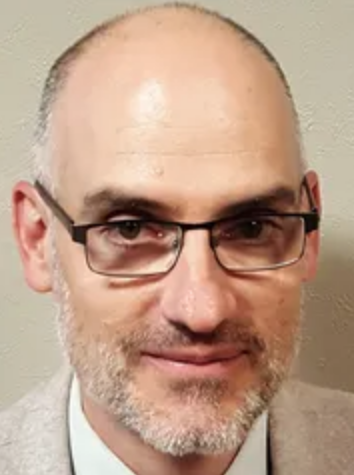 The Director of El Paso County’s Office of Justice and Community Support, Mr. Joel Bishop, is taking his “El Paso Smart Praxis” tool to an entirely new level of disparate impact in risk assessment tools, and El Paso County and the rest of Texas better start paying attention. 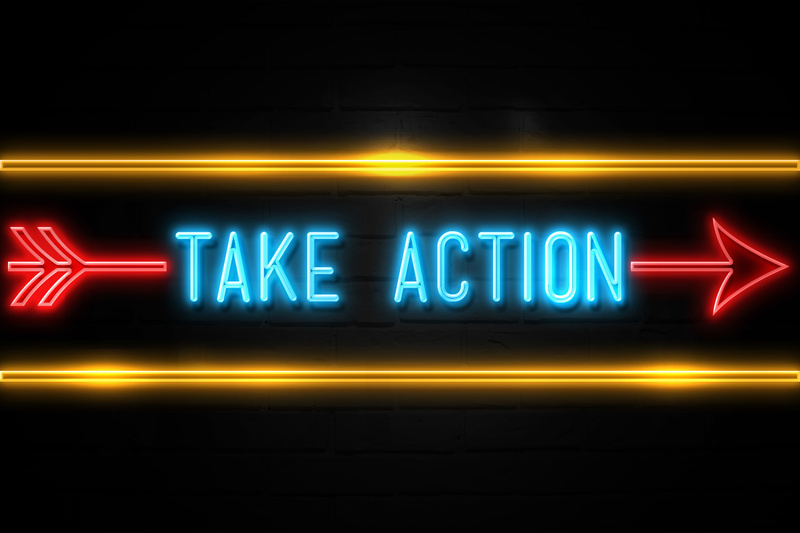 In a records request to El Paso County, we are able to discover some stunning information that, we think, is indicative of the mentality of risk assessment bail reformers, and illustrates a stunning and dangerous slippery slope. Bishop then provides a link to the problem of fatherlessness, noting that “children without fathers in their lives are 20 times more likely to end up in prison or jail.” So, Mr. Bishop’s ground-breaking epiphany turned into immediate action: “So I have a prediction… Fatherlessness will wind up being a top predictor of pretrial misconduct.” He goes on to then suggest that the pretrial risk assessment tool in El Paso County should be modified to incorporate this question, ostensibly to then score someone as higher risk because they didn’t grow up with a dad. If this isn’t direct and inappropriate discrimination against Hispanic and African-American defendants, not to mention all Americans, we certainly don’t know what is. According to the link Mr. Bishop sent, 57.6% of African-American children would be considered fatherless. 31.2% of Hispanic defendants would be considered fatherless. 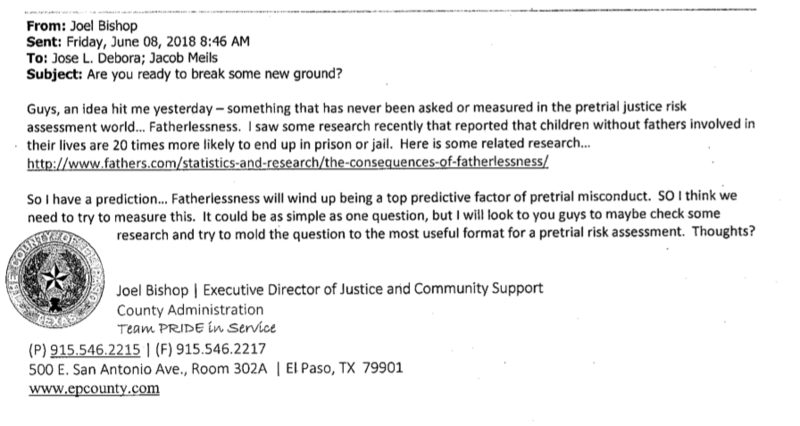 Only 20.7% of white defendants would be considered fatherless. So, the algorithm would be specifically set up to discriminate against African-American defendants by scoring 2/3 of them higher than 80% of their fathered white or fathered Hispanic counterparts due to something that has nothing to do with their criminal conduct or guilt or innocence. 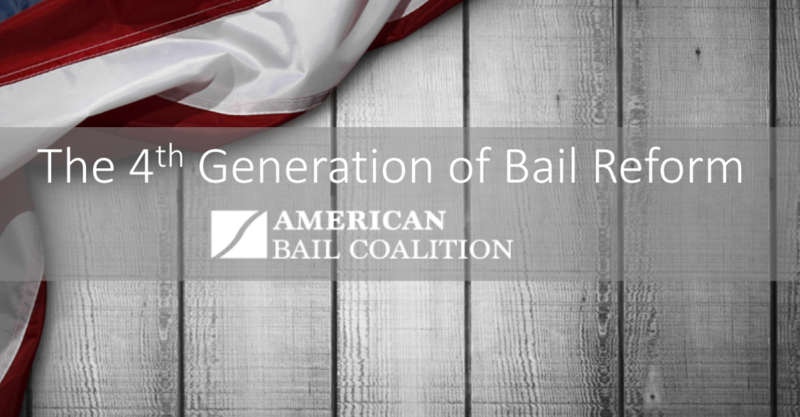 Their right to bail would be conditioned on what their father did or did not do. 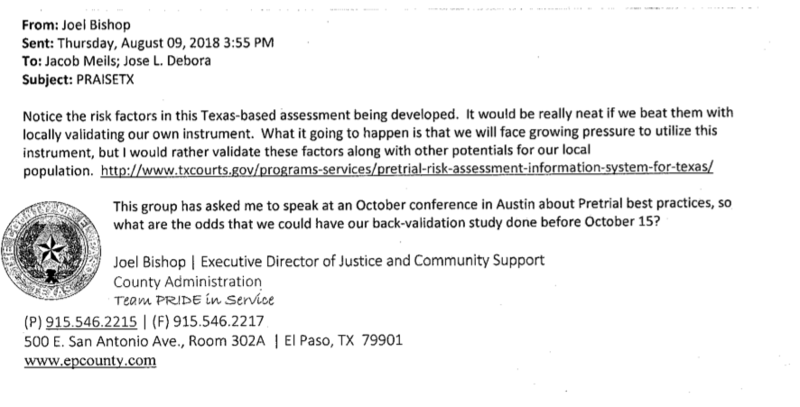 Of course, in another email, Mr. Bishop encourages his staff to “back-validate” the El Paso County tool so that when Mr. Bishop went to a meeting in Austin on October 15, 2018 he would look like a hero because he beat Chief Justice Nathan Hechts’ PRAISTX risk assessment system to the finish line. He also noted in that email that he wanted to not use the statewide system being developed by the Texas State Courts because he wanted to control what factors go into the assessment and not cede control to the State of Texas. In the end, what officials and taxpayers should be asking is how are county officials paying a guy like this, from out of State, with taxpayer money to come in and start using specific and obvious demographic factors that will have the direct effect of holding protected classes down—of forcing them to stay in jail when their white fathered counterparts get out, or trammeling their rights to liberty and privacy by a new supervisory dragnet that the county wants to create. Should we instead just ask what race they are where they live to save the county a lot of money. Simply put, how does that happen in 2019? This unfolding in El Paso is beyond shameful and helps explain why the wild west of algorithms is upon us. It’s time to rein these algorithms in. If El Paso County is going to continue to give the taxpayers’ money to Mr. Bishop and fund these kinds of brilliant, expensive and unproven ideas, they need to be transparent about what he and the county are doing at a minimum when it comes to key civil rights issues like this. Right now, everyone in El Paso County and in Texas are asleep at the wheel on this issue of algorithmic pretrial risk tools. Texans need to wake up and say when it comes to justice by algorithm, enough is enough.